Lake Forest Garage Doors, Lake Forest Garage Door Repair | Overhead Garage Door, Inc.
A damaged garage door is a major inconvenience for your family. It also makes your property far less secure and can be quite an eyesore. Lake Forest homeowners have always taken great pride in their home’s appearance and a damaged garage door can make your property stand out on your block – and not in a good way. Lake Forest residents who are in need of garage door repairs, should call Overhead Garage Door Inc., the overhead garage door experts. As a certified dealer of Clopay Garage Doors, Overhead Garage Door Inc. is proud to provide Lake Forest with quality products, value, and extraordinary service. It is our mission to meet your needs while also enhancing your home’s beauty and improving its worth. Ciopay allows customers to choose from a plethora of styles for a customized garage door that’s usefulness is only eclipsed by its beauty. Our expert technicians can install a new door or opener from our wide catalogue of quality products, or quickly and affordably make much-needed repairs. 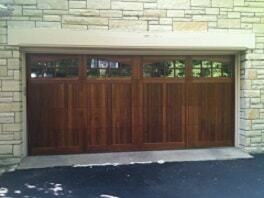 Our courteous, trained professionals will restore your peace of mind and your home’s beauty. 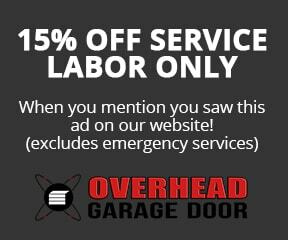 Whether it’s a minor malfunction, damage cause by weather, or a dent sustained in an accident, Overhead Garage Door Inc., will take care of it. We will show up when we are supposed to, and assess the problem, fully explain all potential solutions, and provide you with a complete and thorough estimate before we start any job. Emergency services are available with technicians on call 24 hours a day, seven days a week. Product Lines We invite all Lake Forest residents to review our complete selection of products below and hope that we are able to help you with all your garage door needs. We want to help you fulfill your aspirations of making your home the best it can be.